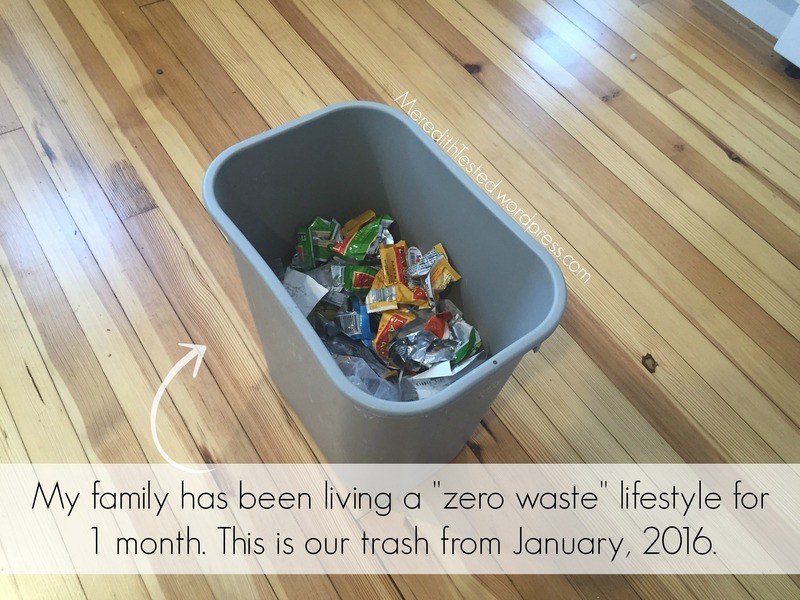 First, check out my post one week in to the zero waste challenge. Back to the one month checkup… Overall, we’re in a good groove now. We’re still learning, still tweaking, still finding packageless sources for our favorite foods and other items, but we’re in a habit now. It feels normal. We’ve got a routine. It happened fast in some ways. But slow in others. Slowly over the month we’ve identified the stores where we can (and like to) buy certain items. And where we can’t buy certain things. We’ve figured out a good system for storage and only have a few things on our wishlist – including more glass containers that we can use for freezer meals. Less waste, less garbage, less plastic, less trash, no disposable or single-use items … But no less joy, happiness, delicious food, or time with family and friends. It’s true that the “set-up” takes some time. Even in the last week of January we found a new local, humane-raised meat source. And we hope to continue to uncover local sources for some of the things we’re currently having a hard time finding packageless, like butter (we’re still using Kerrygold), yogurt and bacon. And now, because I’m sure you are curious, here’s what our trash can looks like after 31 days. The contents are mostly things that we purchased before we committed to this zero waste challenge. Lara bar wrappers, other miscellaneous packaging, and non-recyclable dog food bags. But there are some things that we purchased this month that we just couldn’t avoid – namely, receipts (oh so many receipts – most places auto-print, even our local ‘natural/organic/eco-friendly’ store, lame!) and fruit stickers and/or other packaging related to produce. It also includes a plastic Bob’s Red Mill Arrowroot Powder bag, because I use it a lot for cooking and I have yet to find it in bulk (well, I found it once but for a huge expense and they only had a small jar) or in a larger bag. This photo makes it look like more than is actually in there. It’s a small bin (7 gallons, and yes, made of plastic) and there is a lot of air. We can smash it down to just a few inches. Not shown but worth mentioning is that our recycling has also decreased. Our compost, on the other hand, has increased. Obviously in the past we were throwing out more food and other compostable stuff than we thought. On rare occasions this month I felt a little defeated, wishing I could just pick up something in a package instead of having to search high and low for it. But most of the time I’ve felt empowered, happy that it hasn’t really been a struggle to move towards zero waste, and surprised that many of the changes we’ve made have been easy*. What do you want to know about our zero waste journey? Ask in the comments or email meredithtested @ gmail.com! [Post edited to add:] *We took a lot of steps in 2015 and prior that helped us … more on this in a separate post but basically we have been cutting back on plastic and disposable items for a while before committing to going zero waste. This is truly admirable. I have often started down this road, but thinking about everything and how it’s wrapped in layers and layers of plastic oftentimes, just makes me feel depressed and futile. And then I go get a Reese’s to help me feel better… !!! Your blog is great inspiration. 🙂 Hopefully will get back on the path. I need to be more diligent with my compost in winter especially! It’s easy to just throw it out with the trash!